The widening of this important north-south road, from Hollingdean Road to Falmer, commenced in 1962 and was still continuing when this photograph was taken in 1963. The work was carried in stages, commencing with the stretch from Preston Barracks to Moulsecoomb. Please note that the contemporary photograph has been replaced. The former was taken from the wrong perspective but was corrected in response to the comments below. Tucked away behind the railway viaduct at the bottom of Moulsecoomb Way was a general store or sweetshop called Woolven’s. I was 6 years old in 1963 and it was one of the places where I would delight in spending some of my pocket money which was about half a crown or 2s/6d (12 and a half pence). I could see the viaduct where ‘Woolven’s’ was from our house at 48 Colbourne Avenue in Moulsecoomb so it wasn’t very far. There wasn’t a lot of competition for the store in those days, there was a parade of shops about half a mile north opposite Wild Park and about the same distance going south at The Avenue. There was also a parade of shops a fair way up Moulsecoomb Way opposite the end of Hodshrove Road. Sometimes we used to have to go to The Avenue as there was a post office, a butchers, a general grocery store and the doctor’s surgery; but for a general visit to the sweetshop, it would always be Woolven’s. I have an elder brother and sister, and most of the time we went to Woolven’s together or I would go with either one of them as I was far too young to cross the busy A27 Lewes Road on my own. I remember going along Colbourne Avenue and crossing by the school caretaker’s house on the corner. If we had a day or afternoon out in Wild Park we would usually stop at ‘Woolven’s’ on the way home for some sweets and I particularly liked going there with my Nan as she used to treat me to extras. It is hard to believe that this road was a single lane carriageway. It was very sad when the A27 was widened in 1965 to accommodate the dual carriageway as the shop was right in the middle of the road on what is now the central reservation. I have looked at the local directories and it shows that Mr Woolven was there in 1947 maybe earlier but the directories were a bit vague before this. The actual store goes back to 1931 when it was run by V & R Cooper. Mr Woolven moved his store to Thorndean Road on the Bates Estate and it became a larger general grocery store. We still continued to go to the shop on Bates Estate until we left Moulsecoomb in 1967. I went to Moulsecoomb Seniors from 1968 to 1973 and used the shop quite a lot. I used to have my lunch at my Nan’s flat in Thorndean Road and she would often send me along to buy a loaf of bread or a newspaper before I went back to school. Happy memories! I don’t think I ever went into the shop but do remember that they had a little motor bike with a side car/ice box attached with Woolvens in blue lettering on the side. It used to go around Coldean in the early 1950’s selling 1d lollies and other treats. Lovely driver but we had a very unflattering name for the vehicle – I wonder whether anyone else can remember what we used to call out as it chugged along – come on now, it is only 60+ years ago after all! I remember Woolvens it was part of our great memories, most of us lived in Holingbury we would climb down into the Wild Park area we would spend the whole day playing hide and seek or army games among the trees and bushes, totally exhausted and hot (we seemed to have hot summers in those days). We would make our way down to Woolvens for a bottle of Tizer and a Mars Bar which gave us the energy to make our way back up the hill to Holingbury Camp and back home. These were cherished memories and I am so happy to have been a youngster during these times the young boys today are really missing out on the experiences we used to have. For some reason I have a memory of it on opposite side of road from the school! I was very young when my sister Pamela Smith was there so hopefully will be forgiven as advancing years play havoc with one’s memory. It moved in to Wild Park Close when Bates estate was built and the road was widened. 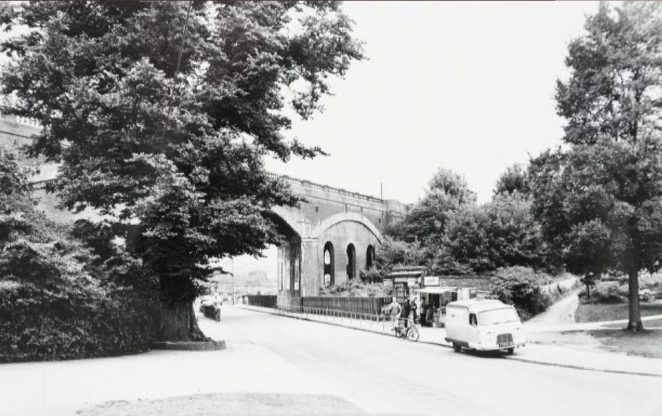 Re: The Mr Woolvens shop on the Lewes Road in Moulsecombe: that was virtually under the railway bridge, the previous owner in the late ’30s, early ’40s was a lady. Try as I may, I can’t remember her name, but she ran the shop single-handed, selling sweets, tobacco, papers etc. including a Vantas (?) machine that produced a soft fizzy drink in various tastes for a penny a glass. I once asked her if she had any jobs wanting to be done and she put me to work clearing the little triangle of garden at the side of the shop, I think my pay was as much of Vantas water I could drink. I don’t think Mr. Woolven was involved in the shop in those days, Can anybody out there remember her? Hi Jennifer. The picture shows ‘Woolvens’ in the original spot before it moved to Bates Estate in 1965 when it was opposite Moulsecoomb school. 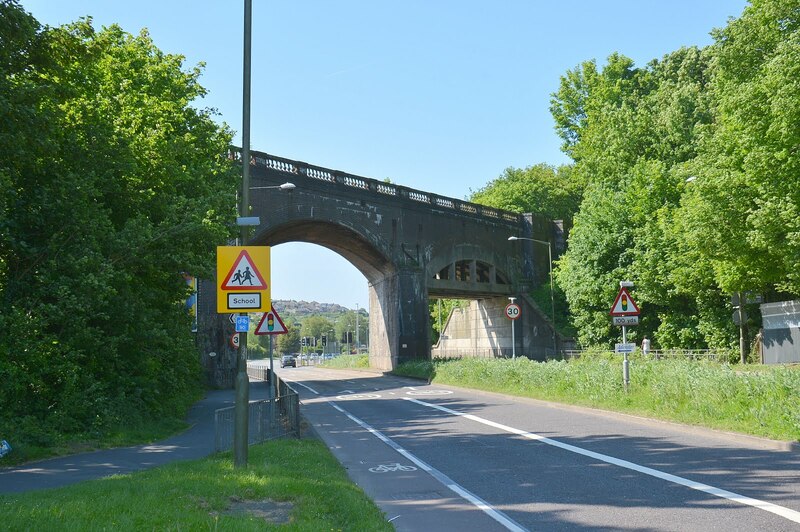 In the picture above, to get to Moulsecoomb school, you had to go to the left under the viaduct and past the bottom of Moulsecoomb Way. The senior school (now the primary) was about 150 yards along the Lewes Road. Many thanks for that Paul, most grateful. . I think that the two photos may be causing confusion as to which side of the road Woolvens was on. Although the caption on the recent photo says it was taken from the same location, it was taken looking north towards Coldean. I believe that the 1963 photo was taken from the other direction, looking south towards the coast. I await being corrected! I agree with you John. The two photos are looking in opposite ways. I saw that immediately. Thanks for speaking up! John Hayes is correct – the upper photo is looking south, the lower photo is looking north. Thanks to those of you who picked up on Paul’s mistake regarding the present day photo of the viaduct. The photo has now been replaced, hope that helps. I remember Woolvens store on Bates Estate from when I used to visit my aunt. There used to be a family living next door called the Bakers. The daughter was called Linda, I think the mother was Dolly. She was always in there putting bets on the horses and the air was blue when she lost! They also used to shop in the store when it was by the bridge because they lived just across the road then in Barcoomb Road. I often wonder what happened to them. Linda Baker married Geoff, Hillman I think, who also came from Moulsecoomb. He was a painter with the council. There was a lady called Dot who worked in the shop; also a little lady called ‘aunty’. Mr Woolven’s daughter was called Pat. She was nice. It was a friendly shop. My late brother and I were keen train spotters. We used to watch the trains from the track that ascended to the kennels at the top of the hill. That shop was a goldmine. With the school opposite and the Moulsecoomb Way factories it did a roaring trade! Many people from Allen West, who got paid on Thursday, would collect their weekly grocery orders from Woolvens. I worked at Allen West in the 1970s after the shop was moved to Bates Estate. Prior to the move the owner ran enough credit slates to tile a roof! Mr. Woolven did act as an unofficial bookmaker! But that is all in the past now. Hi Jenny, Mr Woolven was my father inlaw. I married his only daughter Pat in ’63 at Stanmer church, it was in January (freezing cold) no heating in the church, worse still when we came out. Later that year we took over a lockup shop in Woodingdean at the top of Kipling Ave until 1969 then moved to the new shop in Lockwood crescent. We would often pop over to see Les (Mr Woolven) have a good chat and a game of crib. I think it was 1965 we moved all his stock and freezers over to the new shop in Bates Estate. In 1980 Les was having health problems and taken into hospital with Diabetes, but sadly never came out. Pat and myself managed the shop until it was no longer viable to keep it going. Les Woolven will never be forgotten, he was a Legend. I seem to remember a lady called Pat who worked at Woolvens, delivering groceries to Mrs. Boyle at 1 Twyford Road, Coldean. She was my neighbour. There is an item on Facebook regarding drink vending machines. These machines dispensed Milk, Strawberry flavoured milk and Orange squash. I remember in the early sixties one located outside Woolvens store. It was placed there shortly before the shop was moved to allow the road to be widened.